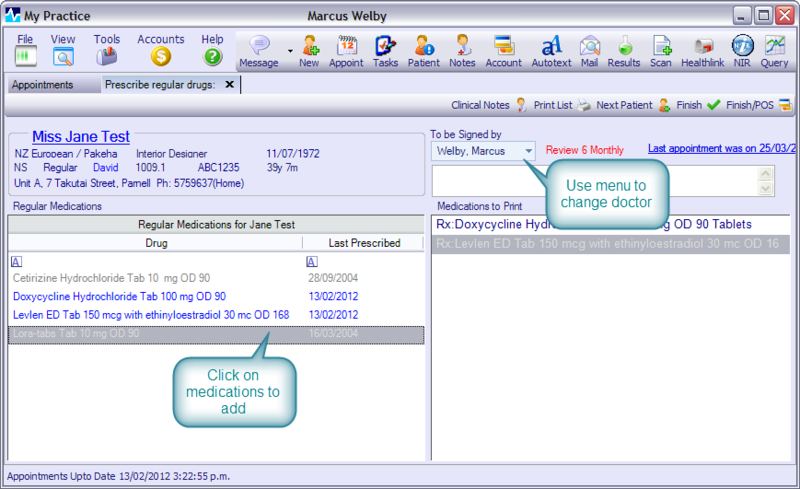 To create a repeat prescription, click on the Repeat Prescriptions button at the top of the screen or select Repeat Prescriptions from the View menu. Search for and select the patient using the search screen. Any routinely prescribed drugs will appear on the left hand list. Double click the drugs you want. These will appear in the list on the right. The Signed By will default to the patient’s regular doctor. Use the drop-down menu to change this if necessary. Next time a repeat is created, it will default back to the regular doctor. Press [Finish] to print or press [Finish/POS] to print and automatically go to the Point of Sale screen or press [Next] to print and automatically go back to the patient Search screen to create another prescription. Bright blue if prescribed today (once double clicked on). Green if prescribed within the last 3 months. Dark blue if more than 3 months ago but less than a year. Grey means not prescribed within a year.